ES flashing is ideal for a flush fit of the window with flat roof coverings such as asphalt, bitumen & chippings, and slate with a thickness up to 10mm. It is applied to individual windows in the slope of the roof. for J level horizontal combinations only. This flashing allows the window to be installed at two different levels in the construction of the roof: V(0cm),J (–3 cm). 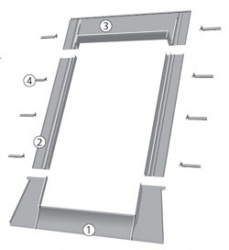 The standard level for installing a window with ES flashing is V - version ESV. Can be used on roofs with pitches between 15° and 90° for level V and 20° and 90° for level J. ESJ flashing can only be used with centre pivot windows. The flashing is made up of four basic elements. The bottom part has a PVC fillet glued on the underside.